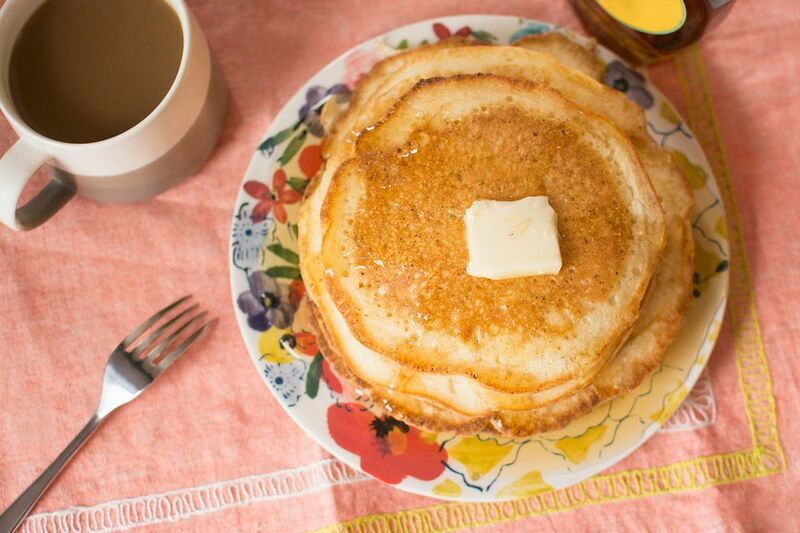 Pancakes are a cinch to make from scratch. You don't need to buy a mix that is likely to contain unwanted additives and preservatives. You can use ingredients you trust and make up a fresh batch in just a couple of extra minutes. It's likely that you buy a mix simply for convenience. But if you keep this simple recipe handy you'll never need to buy another box of pancake mix. You can even make this mix ahead and store it in your pantry. Heat a griddle or pan over medium-high heat. Stir in the milk and oil. Add the remaining ingredients; stir just until the large lumps disappear. Lightly grease the heated griddle or pan. Pour the batter (about 1/4 cup at a time) onto the hot griddle. Cook until bubbles form around the edges, then, flip and cook on the other side. You can add berries, banana slices, chocolate chips, or nuts into your batter to customize the pancakes to your tastes. As a time-saver, measure out all the dry ingredients and store them in a sandwich bag or jar in the pantry. The dry ingredients are the flour, sugar, ​baking powder, and salt. Then, whenever you want to make pancakes for breakfast or a quick dinner, all you'll have to do is add the wet ingredients. To make that easy, make labels to put on the bags that tell how many eggs and how much milk and oil to add. If you don't want to use individual bags, scale up the recipe for the dry ingredients and store in an airtight container. Note that you will need just shy of 2 cups of the mix to add to the wet ingredients per batch. If you make smaller batches of pancakes, you can also scale it down and use 1 cup of dry mix with 1 egg, 1/8 cup of oil, and a little more than 3/4 cup of milk. One bottle of maple extract will last you for years and save you from buying countless bottles of syrup. It's definitely a good addition to a frugal pantry. Store your leftover syrup in the fridge (just like you would the store-bought kind). It has an excellent shelf life. Just heat it back up when you need it again, and enjoy. Do you need or prefer a sugar-free syrup? Just swap the sugar called for in the syrup recipe with one of the sugar substitutes that are designed to replace sugar measure for measure, and you'll have your very own sugar-free syrup.